The Semitron® Semiconductor Grade products were developed to help designers and users optimize the performance of device manufacturing equipment. In addition to device manufacture, many of these materials are ideal for specific environments where wear-resistance, chemical-resistance and the management of static electricity are required. Two groups of products have been developed. One, well suited for device handling and test applications, and a second for next-generation CMP use. Click here to learn about our new Semiconductor grade Semitron® MPR1000. Semitron® MP 370 offers more choices in the design and manufacture of precision test sockets for the semiconductor manufacture industry. While maintaining the same excellent moisture absorption and high thermal resistance of PEEK, Semitron® MP 370 provides greater strength and dimensional stability. This custom formulation allows finer and cleaner detail due to it's excellent machinability. Semitron® MDS 100 has a remarkable combination of strength, stiffness and stability. It was developed to be used in uncontrolled application environments or where a high level of precision is required. It is an ideal choice for semiconductor test sockets, nests and fixtures in test and package equipment. Moisture absorption of .10% at 24 hrs. (per ASTM D570). Semitron® ESd 225 is ideal for fixturing used in the manufacturing of hard disk drives, or for handling in-process silicon wafers. It is tan in color. Surface resistivity: 109 - 1010 ohms/sq. Semitron® ESd 410c is ideal for handling integrated circuits through the test handler environment. It is black in color and opaque. Surface resistivity: 104 - 106 ohms/sq. Semitron® ESd 420 is the only, truly dissipative plastic product for use in high temperature applications. Surface resistivity: 106 - 109 ohms/sq. Semitron® ESd 420V offers dissipative performance of 106 - 109 ohms/sq. over it's full temperature performance range. It is a stiff, high strength material that is not subject to dimensional change as a result of exposure to moisture. Semitron® ESd 420V is a cost effective alternative for applications that do not require the thermal performance of ultra-high performance materials. 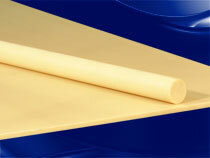 A slightly higher resistivity PEEK based material that offers similar physical properties as Semitron ESd 480. Reinforced with a proprietary synthetic mica, Semitron® ESd 500HR offers an excellent combination of low frictional properties and dimensional stability. Semitron® ESd 500HR should be considered wherever PTFE is used. It is ideal for applications where controlled bleed off of static charges is critical. It is white in color. Semitron® ESd 520HR has an industry first combination of electrostatic dissipation (ESd), high strength and heat resistance. This new ESd material is ideal for making nests, sockets and contactors for test equipment and other device handling components. The key features of 520HR are its unique ability to resist dielectric breakdown at high voltages (>100V). The graph below demonstrates the electrical performance of plastic materials commonly used in automated test handlers. Typical carbon fiber enhanced products become irreversibly more conductive when exposed to even moderate voltage. Only Semitron® ESd 520HR maintains its performance throughout the voltage range, while offering the mechanical performance needed to excel in demanding applications. A test fixture manufacturer recently began using Semitron ESd 520HR that combines electrostatic dissipation (ESD) and high mechanical strength, to make integrated circuit test heads. The high mechanical strength of Semitron® ESd 520HR results in longer useful life of the test heads and, thus, greater units (tested) per hour. Semitron ESd 520HR is the first product to reliably meet all physical performance needs for test nests, sockets and contactors, combined with ESd performance. It is both ESd (surface resistivity of 1010 to 1012 ohms/square) and has sufficient resistance to minimize the risk of 'leakage' (cross-talk). Also significant is the ability of Semitron ESd 520HR to retain its surface resistivity at electrical forces greater than 100 volts. The Semitron® CMP product line was developed to give new tool designers and forward-thinking end users an opportunity to increase the number of devices successfully produced per wafer while decreasing the cost of consumables per device. This is achieved by increasing the service life of the retaining ring. Semitron® CMP LL5 is one of the next-generation materials developed to significantly increase the performance possible from CMP tools. It is white in color and opaque. Semitron® CMP XL20 is the premium CMP material developed by Mitsubishi Chemical Advanced Materials's Research & Development Team. It is charcoal/black in color and opaque.